Explore the fascinating life of the Bushmen to learn how they survive in Africa, even though their traditional way of life is under pressure from modern civilization. The Bushmen are one of the oldest human tribes on Earth. Their genetic lineage traces back directly to the start of the human race. They have learned to survive in the harshest parts of the African sub-continent. They are a nomadic people and follow the game they want to hunt. Their weapons are rudimentary, which include things like poison-tipped arrows. 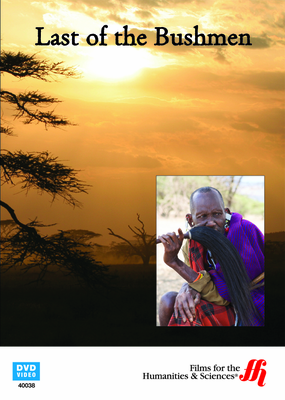 This enhanced DVD has extremely rare video footage of the Bushmen. It shows the extensive efforts they make to prepare for a hunt. Then we follow the men on the hunt to see what they do. We learn the difficulty of capturing a large animal with small hand-held weapons. It shows why the Bushmen may disappear due to modern civilization encroaching on their traditional hunting grounds. The areas they are able to hunt are becoming increasingly restricted and many other people have moved into the land, which they use to have to themselves. They are also under challenge due to their need to hunt on land set aside for modern development and as game reserves. This DVD tells the story of their family life as well and how the women of the tribe play an important role in the tribe’s survival. As their story unfolds, the DVD shows how they build huts, make fire, and get water. It explores their unique language, ancient historical culture, and jewelry making skills. It shows what their future prospects may be for the Bushmen to continue to live in ways, which follow their traditions, and how they survive in the harsh African savanna.